The legend shows the details of the plan, which you should study carefully. Although none of the expansion will be paid for by imposing increased property taxes on Broward County property owners, one should take heed of the amount of mangrove land to be eliminated to accommodate Port expansion in the light blue rectangle to the west (left). Under federal law, the Port must acquire an equivalent amount of mangrove lands to mitigate the destruction of environmentally sensitive lands. 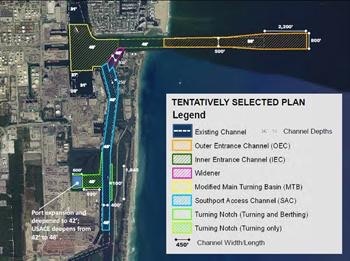 Under the plan, the Outer Entrance Channel will be lengthened and widened. The box in purple called the Widener will increase the size of the turning basin for longer ships required worldwide by the Panama Canal expansion for some of the longest, widest, and heaviest cargo vessels in the World.the forest green box indicating the Inner Entrance Channels will be widened and deepened for traffic flowing to and from the south for loading or offloading. The last two boxes in light green are increase space for Notches for Turning and Berthing or just Turning. The remainder of the colored boxes and lines are as described. Study them carefully. The Plan represents a the Port’s future, a major enterprise operated by Broward County, Florida. This entry was posted in harbors, international, Panama Canal, ships, Trade and tagged Environmental and economic impact study, Expansion, Florida, Panama Canal, Port Everglades on July 6, 2015 by Florida's Big Dig.